Home / Letters From Alaska / The Snow Child is on its way! The Snow Child is on its way! The view from our house today at about noon, the sun shining through the mountains. The Snow Child is being shipped out earlier than expected here in the United States. It should arrive at bookstores and other retailers in the next week or so. Those who have ordered online through sites like Amazon have gotten messages saying their copies on their way. I’d love to hear from anyone who spots it in their local bookstore or gets a copy in the mail! I’m off to the Winter Institute in New Orleans on Wednesday. Around 500 booksellers from around the country will convene to talk about the industry and learn about new books. I’m among more than 50 authors who are attending, along with Julianna Baggott, Richard Ford, Nathan Englander, John Green and many others. The Snow Child received this lovely review in the Book Page today. A librarian who attended high school with me here in Palmer, Alaska, recently wrote this sweet blog post about waiting for The Snow Child to arrive at her house. And last, but certainly not least, the sun has returned! 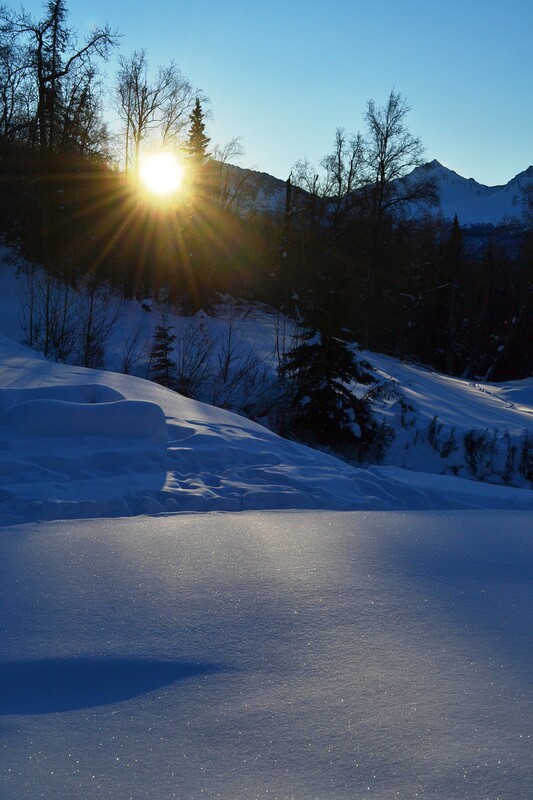 Just a few days ago, the sun crept through the mountains and lit up our snowy yard for the first time in nearly a month. Beautiful, glorious sunshine! Several friends in the States have been asking “when?” Very exciting to have it almost here. I can hardly wait for my copy! I’m going to order mine from Fireside Books! Stay safe and happy traveling, Eowyn. Snuck into Palmer for groceries today and walked over to Fireside to order my copy and copies for our library. So sad to find they are closed on Monday’s – never fear I will be in Palmer tomorrow for a meeting and will get my order in then. Congratulations Eowyn – I can hardly wait to share with our communities! YEAAAAA! For the sun coming, AND the early arrival of your book! Mine will ship out on the 17th! Can’t wait, but guess I’ll have to! Ours came today, already got mine! Woo hoo! Just a note to let you know your book has arrived at the Barnes & Noble in Brandon Fl. We got a call and picked up our pre-ordered copies for my daughter, granddaughter and myself. Can’t wait to start reading. By the way you are not alone in loving the city of New Orleans.